Dentons has advised GLL Real Estate Partners, a Munich-based international real estate investor and asset manager, on the acquisition of Vaci 1, a landmark retail and office building in downtown Budapest for a separate account mandate from Bayerische Versorgungskammer, from Horizon Development, a Hungarian real estate development, property management, leasing and marketing company. Lakatos, Koves & Partners advised Horizon on the deal. Amendments to the Labor Code – Is There More to Come? Amendments to the Hungarian Labor Code entered into force in June 2016. The amendments were approved as part of the Act on the State Budget 2017 and are rather technical, mostly involving provisions that ensure compliance with recently amended European legislation. In this article, we briefly summarize the most important amendments to the Labor Code. On 22 November 2016 the Hungarian Parliament approved the autumn tax package. In addition to the two main objectives of the changes (i.e. reducing the tax charges and increasing competitiveness), decreasing tax bureaucracy has also become important. From 1 January 2017, food and drink automatic vending machines shall be connected to the Hungarian tax authority’s system. The codification of a new Hungarian Administrative Procedural Act and the Hungarian Administrative Court Procedural Act had commenced in 2014. Schoenherr has advised Italian private equity firm Quadrivio SGR S.p.A. on the Hungarian and Slovakian legal aspects of the acquisition of a 70% stake in Farmol S.p.A., and its Hungarian subsidiary Farmol Hungary Kft, from Old Mill Holding S.p.A., an Italian investment holding company. The consideration was not disclosed, and the founders and management team of Farmol will retain the remaining 30% equity stake. The closing of the transaction was announced on October 21, 2016. Klart Legal has announced that Jozsef Zavodnyik, former member of Hungary's Competition Council and Head of Competition at the Hungarian Ministry of Justice, has joined the firm as Counsel. Peterka & Partners has announced management changes in its Russian, Hungarian, and Polish offices, all of which became effective on November 1, 2016. On September 22, 2016, CEELM reported that CA Immo had purchased the Millenium Towers office complex in Budapest in what was described as the biggest real estate transaction of this year in Hungary. CA Immo’s Group Head of Legal Affairs Ingo Steinwender agreed to elaborate on the acquisition. Maria Dardai has joined CMS’ Budapest office as Head of Compliance Projects. 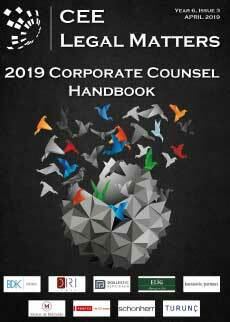 In The Corner Office, we invite Managing Partners at law firms from across the region to share information about the strategies they employ to keep their teams motivated, effective, and focused. For this issue, we asked them to reveal what sorts of firm retreats and activities they host and/or organize for their lawyers. In “The Buzz” we interview experts on the legal industry living and working in Central and Eastern Europe to find out what’s happening in the region and what legislative/professional/cultural trends and developments they’re following closely. Because the interviews are carried out and published on the CEE Legal Matters website on a rolling basis, we’ve marked the dates on which the interviews were originally published. CMS has advised American International Group, Inc. on the Central European aspects of the sale of some of its insurance operations to Fairfax Financial Holdings Limited. CMS worked alongside global counsel Debevoise & Plimpton. Kinstellar’s Budapest office has advised CIG Pannonia Life Insurance on the purchase of local peers MKB General Insurance and MKB Life Insurance from Versicherungskammer Bayern. The identity of the seller was not disclosed. Oppenheim has announced that Of Counsel Attila Menyhard was appointed the new Dean of the ELTE School of Law and took over in the role in July 2016. The Kapolyi Law Firm recently advised Wingholding Ltd., the largest real-estate developer in Hungary, on the feasibility of the public and private placement of corporate bonds. The EU trademark history of the Rubik’s Cube, which was invented in 1974 by the Hungarian Erno Rubik, goes back to April 1, 1996, when the UK-based company Seven Towns Ltd, filed an application to register the “three-dimensional puzzles” trademark by using the three-dimensional mark of the Rubik’s Cube. The trademark for the shape was issued by the EU’s Trademark Office (EUIPO) on April 6, 1999.